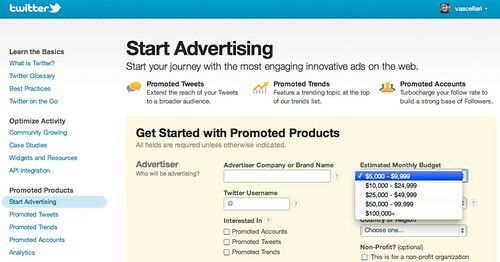 Are you interested in having your ads on Twitter? Yes? Ok, that’ll be at least $5000. Looking at the ‘natural influence’ of big brands that probably have no need for ads on Twitter vs the 5k minimum budget for smaller businesses and other players that want to make their voices heard it’s certainly something that makes me think. Beth Harte recently grabbed my attention on this topic with a Facebook update, I’m interested to hear your thoughts on this ‘barrier’ at the entrance that Twitter has set. Author Andrea VascellariPosted on April 22, 2011 Categories Business, Social Web, StrategyTags advertising, andrea vascellari, beth harte, budget, itive, itive.net, social media, twitter, twitter advertising3 Comments on Twitter Advertising? 5K. Thanks.